While the Orange Fury paint colour is available in both Canada and the United States, Helios Yellow paint won't be available north of the border. Honda Canada has added safety features, a new trim line and a few extra dollars to its 2018 model of the five-door subcompact Fit. The starting price on the base model DX with manual transmission is $16,785, including delivery fee. That’s an increase of $140 over the outgoing 2017 base model. Honda has also added a new Sport trim, which slots in between the lower-end DX and LX trims and the higher-end EX and EX-L trims. The automaker didn’t reveal pricing beyond the base model Thursday. 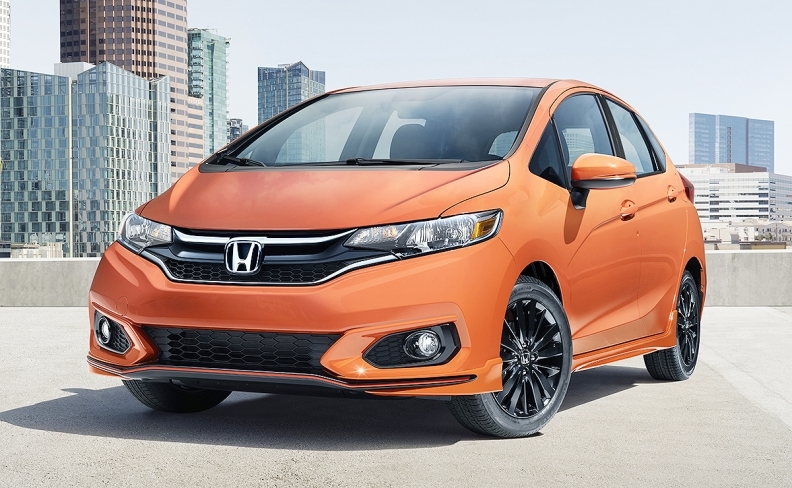 The new Fit Sport adds is equipped with an aggressive aero-form front spoiler and rear diffuser, bright orange pin-striping, 16-inch aluminum alloy wheels with gloss-black finish, chrome exhaust-pipe finisher and side sill garnishes. While the Orange Fury paint colour is available in both Canada and the United States, Helios Yellow paint won’t be available north of the border. The automaker has also made its Honda Sensing suite of advanced safety and driver assistance features standard on all 2018 Fit continuously variable transmission (CVT) models, a first for the Fit. CVT is available on every model but the base DX. Also new for 2018 is a seven-inch display touchscreen featuring Apple CarPlay and Android Auto compatibility, included on only the Fit LX, Sport, EX and EX-L trims. All 2018 Fit trim lines comes with a 1.5-litre, four-cylinder engine that delivers up to 130 horsepower. Equipped with the manual transmission, the Fit uses 8.1 litres of fuel per 100 km while driving in the city, 6.6 litres on the highway and a combined 7.4l/100 km overall. The automatic transmission uses 7.6/6.5/7.0. The Fit goes on sale across Canada today. Sales of the Fit in Canada have plummeted through the first seven months of 2017, down 44.5 per cent to just 2,623 units. Sales of the car were also down five per cent to 8,622 units in 2016 when compared with the year before.